This Village is looking for it's next Mayor! On top of the mantle or under the tree-this quaint wooden village is perfect for the Christmas Holiday Season, and for train layouts too. Painting and assembling is a fun-filled project for young and old. Keep the set as a family treasure or fill each house with goodies for the ideal gift and candy box. The Greenleaf Company Store - Photos include a zoom tool so that you can see detail like never before. Visit the Greenleaf Village Kit page to see for yourself! The Greenleaf Village Kit Construction Blog - Detailed photos of the assembly process can be found along with finished pictures at our construction blogs. Unfortunately, the blog for this house is currently unavailable. Tracy Topps Owner's Gallery - Tracy has done an unbelievable job on this house! Adding a basement and finishing the house in paper clay are just a few of the highlights. Visit Tracy's Greenleaf Village Kit to see the full potential of this house! If you have pictures of your Westville that you would like to have considered for viewing from this page, please feel free to post them in the Owners Gallery at the Greenleaf Miniature Community. It's free and it's fun! For more information, please visit our miniature forum for details on how to join! 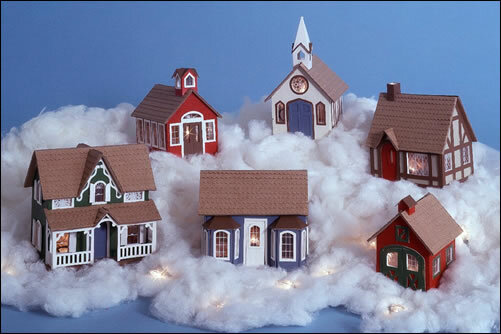 The Greenleaf Company Store - Buy factory direct from Greenleaf Dollhouses Company Store! Visit the Greenleaf Village Kit at our online store for even more info and pictures as well as purchasing information!